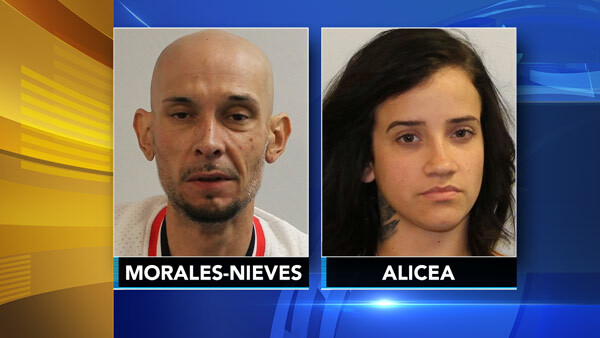 GLOUCESTER TWP., N.J. (WPVI) -- The New Jersey State Police arrested a man and woman from Philadelphia and seized more than $2,100 worth of drugs. They also recovered a handgun. It happened around 11 p.m. Saturday during a traffic stop on State Highway 42 southbound in Gloucester Township. Trooper Justin Dolan stopped the vehicle for a traffic violation. During the stop, the trooper arrested 38-year-old Jose Morales-Nieves for suspicion of DWI. State police say the trooper then discovered that Morales-Nieves and 24-year-old Kimberly Alicea were in possession of 15 grams of crack cocaine, 30 grams of marijuana, prescription legend drugs, drug paraphernalia, a loaded 9mm handgun with hollow-point ammunition, and more than $13,900 cash. Morales-Nieves and Alicea were charged with possession of crack cocaine, possession of crack cocaine with intent to distribute, possession of marijuana, unlawful possession of a weapon, possession of a firearm while committing a drug offense, possession of drug paraphernalia, possession of hollow point ammunition, and possession of prescription legend drugs. Morales-Nieves was also charged with criminal under the influence and DWI. They were both taken to the Camden County Jail and are awaiting a bail hearing.